Second grade students at Lanigan made the trip to Volney recently to meet, greet, play and eat. Pen pals Allie Warner (Volney), Emily Grego (Lanigan) and Laura Bartlett (Volney) get to know each other over an activity during a pen pal picnic held at Volney Elementary School. The trio has written more than a dozen letters to each other, all school year long, as part of a cooperative pen pal project. They met for the first time at the picnic. The pen pal picnic, held yearly between Rauri Downes’ class at Volney Elementary and Terry Merritt’s class at Lanigan, was an opportunity for the two classes to meet face to face for the first time. The long-distance friends have been corresponding to each others letters since the beginning of the year. Downes’ kicked off the celebration by reading Smelly Socks by Robert Munsch, a tale of a girl who loves her new socks so much, she declares that she will never take them off. That is until the socks start to reek, and her friends step in. Story time was followed by a getting to know each other activity. 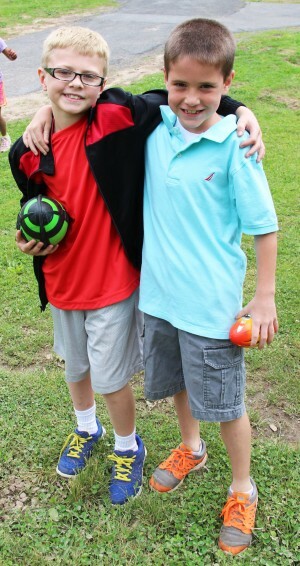 Pen pals Mason Fuller, left from Lanigan, and Tyler Ditton from Volney toss around a football during the annual pen pal picnic. Students paired up with their pals and asked questions about their favorite activities, food and family life. 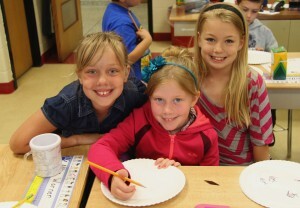 The answers were recorded through drawings on paper plates. Buddies shared their findings during an informal presentation. The pen pals played on the playground, enjoyed lunch and presented one another with cards and colored mugs. The pen pal project between Downes and Merritt is a more than 10-year tradition that serves to encourage students’ writing and social skills, as well as reading comprehension skills. This picnic was the last collaboration between the two teachers, as Merritt is retiring. Merritt is confident that the tradition will live on without her. “The most rewarding thing is when high school students come back to visit and say that their still friends with the pen pal they made in second grade,” said Merritt.